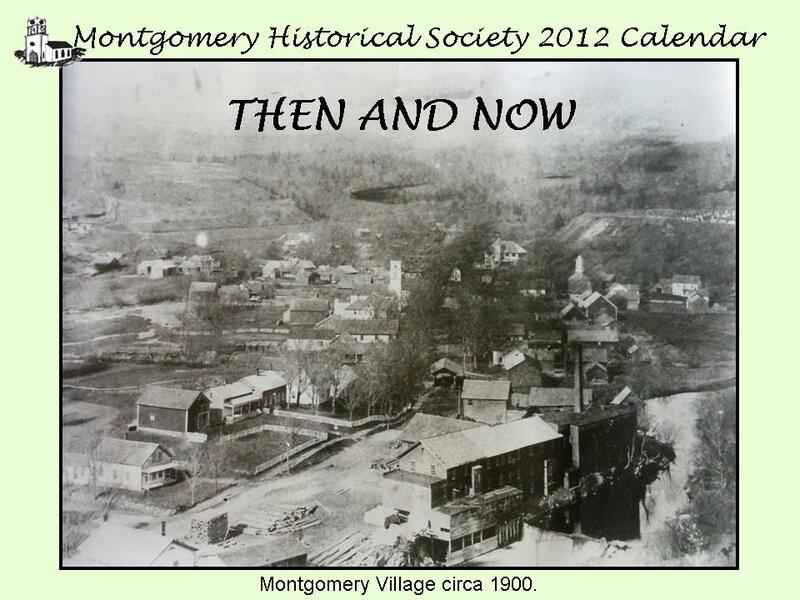 It's not too late to get one of our 2012 calendars, "Then and Now", featuring old photos of Montgomery and the corresponding view today. 1. From 1800 to 2010 there have been 21 censuses. How many times did Montgomery's population change by at least a double digit percentage? 2. From 1810 to present, what decade showed the greatest relative % change? 3. From 1810 to present, what decade showed the least relative % change? New Year's Resolution: We will stop procrastinating... starting first thing tomorrow. The MHS Directors breathed a collective sign of relief as 2011 drew to a close. It was just a year ago that demolition on the Hall was in full swing and snow was drifting in the gaping holes at the base of the clock tower. Some of the rot uncovered took our breath away. Today, someone unfamiliar with the project would be hard pressed to detect we've done anything at all, a true measure of our success. - Our builder, Jan Lewandoski and his staff for their meticulous restoration. - Our financial grantors, the VT Div. 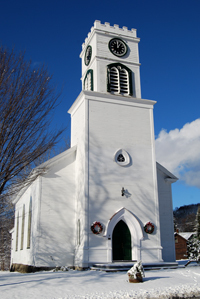 for Historic Preservation, Preservation Trust of VT, Eastman Charitable Trust, and the National Trust for Historic Preservation who, combined, accounted for about a third of the project's cost. - Our membership and TD Bank's Affinity grant program which covered another third. - Donations of services and material accounted for about another third, Prominent were St. Onge construction, Lutz Automotive, and Andre Gareau for donating demolition, snow plowing and excavation respectively. - Bill McGroarty, Pat Farmer, Tim Chapin and Ken Secor brought the project to a finish by donating their labor and creativity, painting the exterior, building the new steps and deck, rehabbing the doors, and repairing the interior. This group, dubbed the "Men with Tools", discussed (read argued) for hours on function, design and politics, building consensus then springing into action. - Marijke Dollois, Noela McGroarty finished prepping and painting the interior walls and ceiling. Marijke also preserved our plants and the garden beds. - Others chipped in where they could, painting, clearing debris, cleaning, hauling, and offering words of encouragement. - The Covered Bridges Garden Club helped with our spring spruce up. - Through it all the MHS Board provided direction, oversight, and support. Phew! I'm getting tired just writing about it. As 2012 gets underway we will continue planning for the much larger project involving the Hall's western wall and foundation. We also hope to paint the tower and front wall of the church and offer our full array of programs and services, including exhibiting at the biannual history expo in Tunbridge in June. We have more work to do. Let's get busy. Thanks for your support & Happy New Year. Pratt Hall hosted a Celebration of Zack's Life in November. Zack was a life member of the Society. Guests reminisced about a life well lived while enjoying Mushrooms Monkey Center and other goodies, and watching videos featuring Zack and his restaurant. 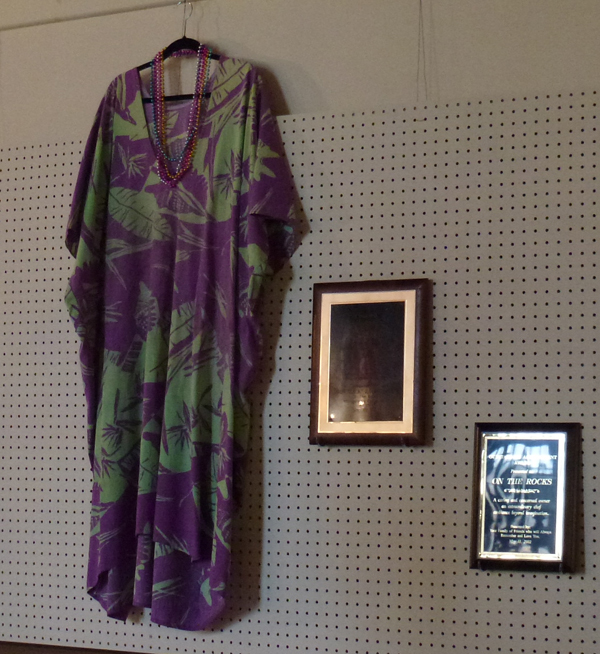 The Hall was filled with personal pieces including plaques, menus, caftans, crowns and photos galore. Our thanks to Lucille Morin for donating Zack's things, to our own Sue Wilson for organizing the event and to Sue, Elsie Saborwoski, Parma Jewett, Marijke Dollois, and Noela McGroarty for pulling together the displays. Want to know what the District 6 one room school house at the corner of Hazen's Notch and Amidon Roads looked like? It's not too late to pick up one of these gems that show Montgomery "Then and Now"!!! Over 100 have been sold so far. Thanks to Parma Jewett for leading the effort. Calendars can still be purchased at Lutz's, the Town Office, or via email or USPS. Our neighbor across the street has a new owner and has re-opened as the Black Lantern. This longtime coach stop and tavern on the National Register of Historic Places, is now owned by Greg Lucas and will offer all the usual amenities. Welcome. We also want to wish all the best to Bob and Deb Winders, the Inn's previous owners, and thank them for their generous support to the Society over the years. God speed and following winds. Pratt Hall will host the monthly meeting of the Community of Expressive Artists (CEA) on January 20th. This group meets monthly to feature performances by three regional artists, including writers and musicians. It's open to all and is meant to foster a supportive environment for people to express themselves, develop, and network. The Dr. John Tortalano presentation on the Canadian Group of 7 landscape painters has been re-scheduled for May 17th at 7:30 at Pratt Hall. We are also working on a presentation on Ethan Allen's Canadian connection for later this year. Stay tuned for times and other details. The MHS Board approved the use of the side of the Heaton House next to Pratt Hall facing Route 118 for display of a Barn Quilt, a 4' X 4' piece of plywood painted like a quilt block. There are nearly 50 in Franklin County between Berkshire, Enosburg, Franklin, Richford, Sheldon and St. Albans on what's called the Franklin County Quilt Trail. The Trail was organized by the Sheldon Raiders Homemaker's Club. This would be the first we know of in Montgomery. Besides their intrinsic beauty they attract quilting aficionados from around the country. More details will be provided as information develops. Thanks to the technical expertise of member Suzanne Dollois, the MHS now has a facebook page. We will use it to help get out the word about our programs and events. You can visit it at http://www.facebook.com/mhs.vt. Don't forget to friend us! You might wonder what wrath the lord sent us. The thought overwhelms all my senses. January 1933 - Calvin Coolidge dies in North Adams, MA. February 1865 - "Snowflake" Bentley born. March 1793 - Montgomery's first settlers, Joshua and Naby Clapp, arrive. Son Joel would be born in the fall and they would be the only settlers in Montgomery or any surrounding town for 2 1/2 years. Our second annual three day celebration of the Holiday Season was a fun and successful event. 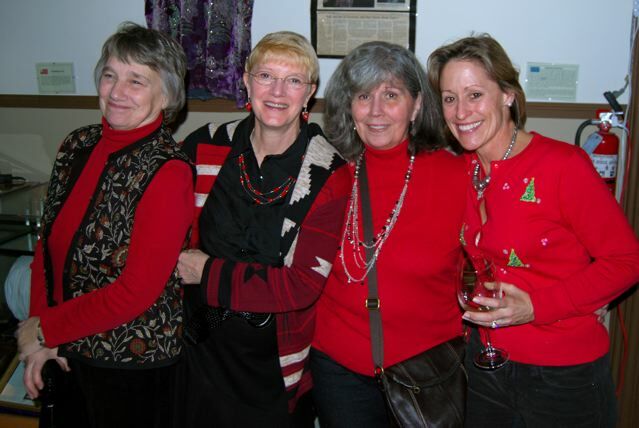 The Friday Member Holiday Social ushered in the weekend, followed by a Open House the next day, and culminated in the annual Carols and Candles celebration. Andrew Massey and the Montgomery Symphony Orchestra reprised their efforts to get everyone to at least start and stop singing at the same time. 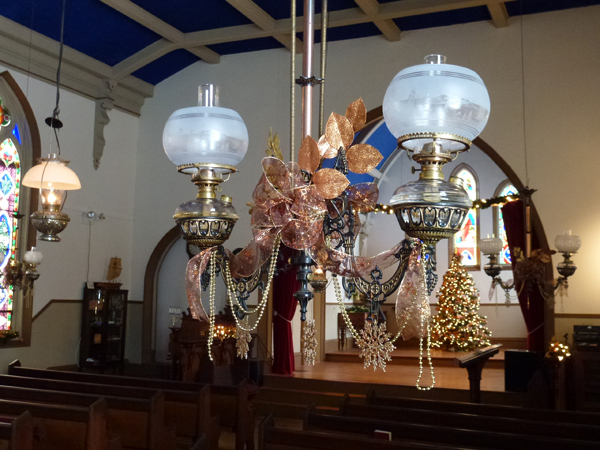 Our thanks to them as usual and to Chief decorator, Noela McGroarty for transforming the Hall from the Zack memorial to the spectacular gold and copper Christmas decor. Bravo all. Our 2011 membership drive was the most successful ever. We had 221 memberships which raised just over $11,700 (an 11% increase over 2010). This included 15 new members and 19 business members. Our median donation was $35 and our average donation was $55. 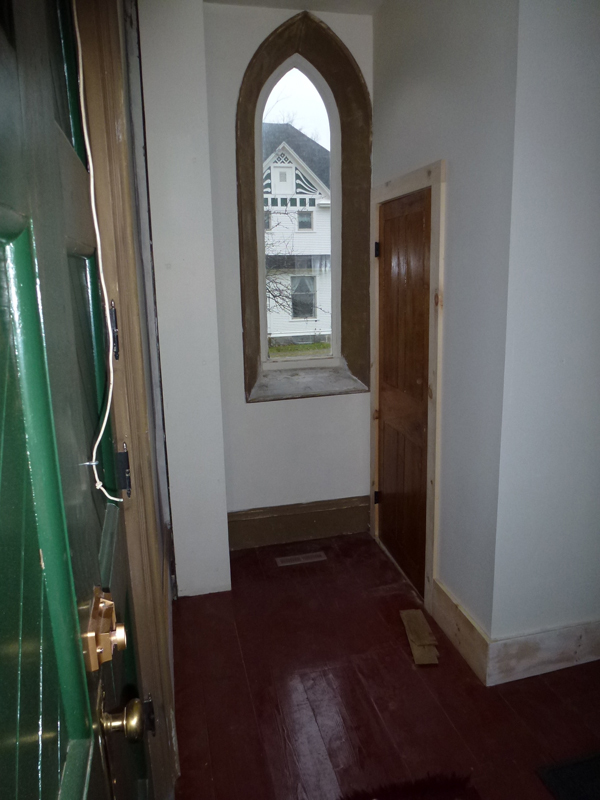 Your support was crucial to our successful entryway and tower project. Thanks to all of you and to Marijke Dollois for another phenomenal job. 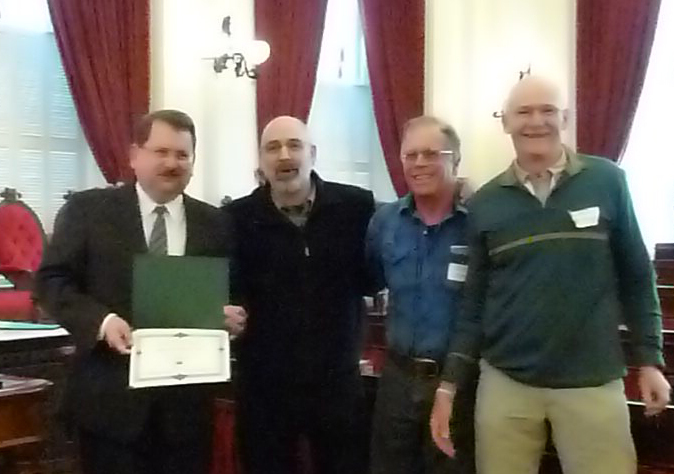 We won an award for Historic Preservation! The LLHS award Committee said "The scope of the project, and commitment to the careful quality workmanship despite the hurdles encountered is inspiring. It is evident that your local Society realizes and greatly appreciates the treasures within their community." This is our 8th LLHS award since 2007 and is a testament to our hard work and your support. Those of you who were able to join us for our holiday events may have noticed we have finished the interior of the entryway. This completes the project until next summer when we will add a wheelchair ramp. Special thanks to Don Bateman, Bill McGroarty, Noela McGroarty, and Marijke Dollois for the patching, sanding, & painting, and to Pat Farmer and Ken Secor who finished off the new front closet. The Winter issue of Yankee Magazine has an article on the caretaker of the Hancock, NH town clock. It's illustrative of some of the issues we struggle with and an entertaining read. 1. c. 15. 4 double digit decreases and 11 double digit increases.